The nomination deadline for the 2019 Alumni Awards has passed. Please let us know if you'd like to submit a nomination for 2020. Since 1946, Alumni Awards have been presented to Illinois Institute of Technology's most accomplished, innovative, and influential alumni. Alumni Award winners add to our university's rich history of visionaries who make the Illinois Tech community proud. View past winners. Each year Alumni Awards are presented in nine categories, detailed below. The opportunity to honor alumni from around the world would not be possible without the assistance of the greater Illinois Tech community. Please let us know when you encounter an alumnus or alumna who has made a remarkable contribution to society, the university, or his or her profession and nominate him or her for an Alumni Award. Complete one of the nomination forms below or send your responses to alumni@iit.edu. Nominations may also be submitted via email or mail to the Office of Alumni Engagement. All nominations must consist of a completed nomination form. Additionally, nominations may include up to two letters of recommendation and a brief biography, CV or resume detailing the nominee’s accomplishments. Neither nominators nor those submitting letters of recommendation are required to be alumni. For more information, please contact the Office of Alumni Engagement at alumni@iit.edu or 312.567.5000. The 2019 Alumni Awards will be presented in Fall 2019. The Alumni Medal honors distinguished service to the university by alumni who have displayed the qualities of the Collens Merit Award, Alumni Service Award, and Professional Achievement Award. This is the highest honor bestowed by the Illinois Institute of Technology Alumni Association. Submit a nomination for the Alumni Medal. The Alumni Service Award honors an individual who demonstrates continuous, selfless commitment to and devoted enthusiasm for Illinois Institute of Technology through involvement in various areas of the university including, but not limited to, recruitment, support, service, and leadership. Submit a nomination for the Alumni Service Award. The Collens Merit Award is awarded to an individual nominated by the staff and/or faculty who has demonstrated outstanding commitment to the future of Illinois Institute of Technology through philanthropic contributions paired with involvement in his or her gift. Submit a nomination for the Collens Merit Award. The International Award of Merit recognizes an individual whose achievements have strengthened Illinois Institute of Technology's reputation on an international scale. Submit a nomination for the International Award of Merit. The John J. Schommer Honor I Award is awarded to alumni who excelled in both leadership and performance as student athletes at Illinois Institute of Technology and who also went on to achieve significant success after graduation. Submit a nomination for the John J. Schommer Honor I Award. The Lifetime Achievement Award is bestowed posthumously on an individual who has recently passed away and who, during his or her life, achieved personal success, made an outstanding contribution to his or her chosen field of endeavor, and achieved recognition by his or her colleagues. Submit a nomination for the Lifetime Achievement Award. The Outstanding Young Alumnus/Alumna Award honors alumni age 40 or younger who have advanced rapidly over the course of their careers and have displayed significant achievement in the areas of leadership and professional success. Submit a nomination for the Outstanding Young Alumnus/Alumna Award. 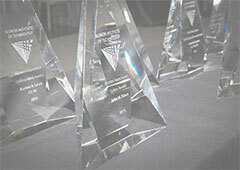 Submit a nomination for the Professional Achievement Award. Completed nominations will be held as active and under consideration for one additional year should they not be selected in the year they are submitted. Nominators are welcome to update nominations in the second year. If a nomination is not selected after two years of eligibility, it will expire. Two years must pass after expiration before a nomination may be re-submitted. Any re-submitted nominations must contain new material. All Alumni Award recipients are selected by a volunteer sub-committee of the Alumni Association Board of Directors that includes previous Alumni Award winners. All winners must be approved by the Illinois Institute of Technology president. Current employees of Illinois Institute of Technology are not eligible to win Alumni Awards. The number of awards bestowed may change from year to year based on the selection committee's votes. If the committee decides there are no qualified candidates in a given category, it may elect to pass on bestowing that award in that particular year. The selection committee may also elect to change the category of a nomination and consider it for a different category than that in which it was submitted. If the nomination is selected as a winner after changing categories, the nominator will be consulted before the award is finalized in order to verify that the change is appropriate.